There is a trail that Deborah and I have hiked many times over the years. 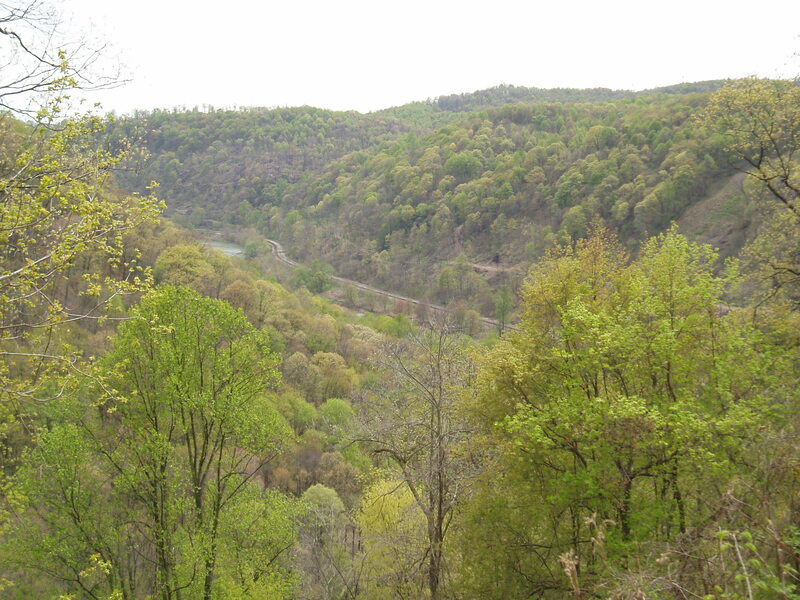 We call it the “Up and Over,” and it runs up the north side ridge of the Kiski River and then down into the ravine of Roaring Run Creek. It is a very seldom walked trail although there are a few mountain biking paths that get some activity especially on nice, sunny weekend days. A great thing about hiking familiar trails is that you have a mental map of all of the nice spots where you can take short rests along the way. 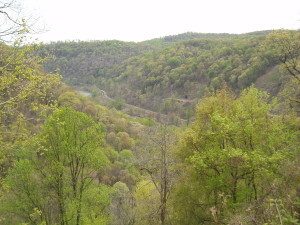 One of these places on the Up and Over is a sitting log under a large red maple way up on the crest of the Kiski Ridge. When you sit on the log (munching some favorite snack and having a cool drink from your water bottle) you look down over the Kiskiminetas River which runs fast and shallow over its red-brown, silt covered rocks and out across the tree covered framing hillsides and the distant ridges. Deborah’s picture above shows the scene from this spot in early April (next week I’ll show you what it looks like a month later!). I remember sitting in this spot a couple of years ago in the third week of March before any of the trees had leafed out. It was a sunny day but damp and cold. There were even a few lingering patches of snow on the north-facing slopes and in some of the more shaded hollows. About a third of the trees had a fuzzy, reddish glow around their sun-lit branches. These were the first flowering trees of the season and quite obviously from this high vantage point the single most abundant type of tree throughout this river valley. These gently glowing, red flowering trees were red maples. The other common names of red maple describe important aspects of its ecology and uses. “Swamp maple” and “water maple” tell us that this species is a tree of wet soils. “Soft maple” indicates that the wood is easily worked (and maybe not as strong as the wood of some other types of trees), and “scarlet maple” is a name for those who maybe crave more elegant adjectives! The presence of red maple all along the river and up the creek-cut hollows made sense relative to the tree’s ecological names, but the abundance of the tree along both the north-facing and south-facing ridges doesn’t seem to fit. Red maples were everywhere. Why? Through the twentieth century, the red maple became one of the most widespread and abundant trees in eastern North America. In the pre-settlement forest, red maple was found in the places described by its many common names. It was a relatively minor tree of the overall forest and was concentrated in wet, poorly drained sites. How and why did this species proliferate so greatly? How and why did it spread over most of the available landscape? One of the reasons that explain the “why and how” of red maples is the tree’s great ability to make seed. 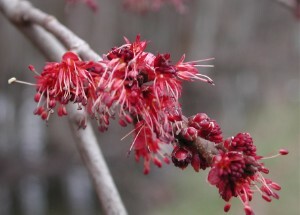 Flowering and seed production can begin in a red maple as young as four years of age. Young trees that are two to eight inches in diameter can make tens of thousands of seeds each year. Older trees that are a foot or more in diameter can make a million seeds in a single year. Bumper crops of seeds are produced every other year, but every year is a good seed year for red maples. The seeds mature in double, winged samara and are shed from the parental tree in late spring. There are very few germination requirements for the red maple seeds. They can germinate in the shade under the parental tree, or in the direct sun many hundreds of yards away. They can germinate in very wet conditions or in very dry conditions. They can germinate on piles of leaf litter, on bare mineral soil, in cracks in sidewalks and driveways, in rain gutters, and even under the windshield wiper blades of a 1990 Geo Prism (personal observation). Ninety percent of the seeds produced can germinate and they are able to do so almost immediately after flying away from the parental tree. The small seeds in their samaras can fly great distances in a strong wind. 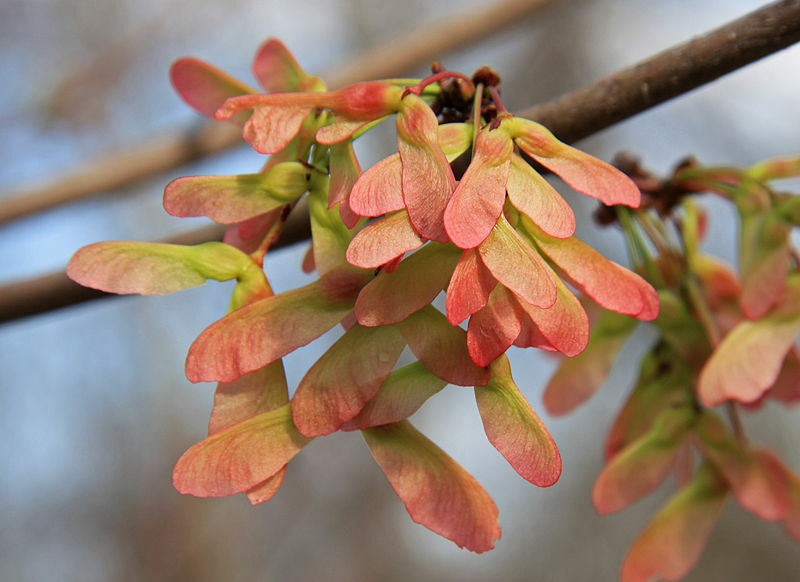 Any area with red maple trees will fill up with red maple seeds and seedlings, and this system saturation will be renewed each year! Most of the first year seedlings will not survive, but since there are so many of them each, and since each passing year adds countless more to the population, in a short period of time the forest understory will be full of red maples. What is the nature of the competition and stress matrix affecting a red maple seedling? First of all, there are the thousands of other red maple seedlings. For an individual seedling to prevail its genetic make-up and physiological potential must match up with the restrictions and factors of its environment. Many studies have described the broad genetic range of red maple populations: different genetic types are found (and, therefore, have succeeded) in wet lowlands and in dry ridge ecosystems. Root growth patterns in these extreme sites are different (deep roots are favored in dry sites but shallow, spreading roots are favored in wet). Secondly, the seedling’s energy potentials must match the restrictions of its site. If it is in the deep shade of a closed canopy forest, the seedling must be able to live at low photosynthetic activity (and comparably low respiratory and growth activity) for many years. If the seedling is out in the full sun, it must be able to handle the large energy input of the full sun exposure and the potentially dry conditions that full sunlight exposure might generate. For better or worse, I rarely take time to comment on any blogs, Facebook posts, etc., but I want you to know that I read, enjoy, and always learn something from your essays. I trust that your students are grateful, too. The bees love red maple and as the first large scale flowering trees, their blooms are essential for the hives as they come out of winter. We have a lot of them in our wood lot which is a big reason our bees do well. We also have a lot of Norway maples. The bees show no interest in their green blossoms and norways seem to be even more aggressive than their red cousins. Maybe you should do a followup on them?